Machining and cutting technologies are still crucial for many manufacturing processes. 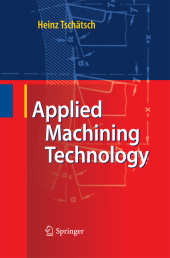 This reference presents all important machining processes in a comprehensive and coherent way. It includes many examples of concrete calculations, problems and solutions. Fundamentals of machining explained for turning.- Tool life T.- Tool- and machine curves.- Metal removal rate and chip volume ratio.- Cutting materials.- Turning.- Planning and slotting.- Drilling.- Sawing.- Milling.- Broaching.- Grinding.- Abrasive cutting.- Abrasive belt grinding.- Honing.- Superfinishing (shortstroke honing).- Lapping.- Further refinement of the cutting materials.- High speed cutting (HSC).- Cutting fluids (coolants and lubricants).- Cutting force measurement in machining.- Tables for general use. Prof. Dr. Heinz Tschätsch lehrte nach vielen Jahren in führender Position in der Industrie zuletzt an der FH Konstanz.